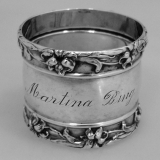 American sterling silver napkin ring with beautiful floral engravings, monogrammed JFM. Dimensions: 1 3/4" - 1 1/2", weight 55 grams or 1.8 ozs Troy. The excellent original condition and clear, crisp detail, with no removals, repairs or alterations, make this an especially attractive offering. Monogrammed as described above, the soft, warm, original antique finish is present, with no buffing or machine polishing. American coin silver napkin ring c. 1900. 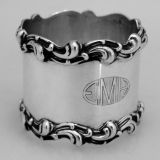 This beautiful napkin ring has floral engravings around the body and a beautiful period script monogram EM. Dimensions: 2" - 1 1/2", weight 45 grams or 1.4 ozs Troy. The excellent original condition and clear, crisp detail, with no removals, repairs or alterations, make this an especially attractive offering. Monogrammed as described above, the soft, warm, original antique finish is present, with no buffing or machine polishing. There are no marks but guaranteed to be as represented. British sterling silver napkin ring with a tapered body and applied fancy borders. Dimensions: 2" - 1 3/8", weight 58 grams or 1.9 ozs Troy. The excellent original condition and clear, crisp detail, with no monograms, removals, repairs or alterations, make this an especially attractive offering. The soft, warm, original antique finish is present, with no buffing or machine polishing. American sterling silver Zodiac napkin ring by Gorham Silversmiths c. 1900. 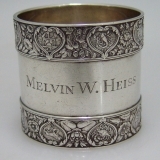 This impressive napkin ring has wide borders with embossed Signs of the Zodiac and corresponding flowers and is inscribed: Melvin W Heiss on the center of the body. Weighing 72 grams or 2.3ozs. Troy, this wonderful napkin ring is 1 7/8" in diameter and 2" tall. The excellent original condition and clear, crisp detail, with no removals, repairs or alterations, make this an especially attractive offering. Inscribed as described above, the soft, warm, original antique finish is present, with no buffing or machine polishing. 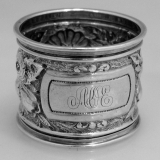 American sterling silver napkin ring made by Hartford Sterling Co. Phila c. 1900. This large and heavy napkin ring has an applied double beaded borders, monogrammed CMC. Dimensions:1 7/8" X 1 1/4" and weighs a very substantial 66 grams or 2.1 ozs Troy. The excellent original condition and clear, crisp detail, with no removals, repairs or alterations, make this an especially attractive offering. Monogrammed as described above, the soft, warm, original finish is present, with no buffing or machine polishing. Mexican sterling silver napkin ring by Maciel c. 1950. This attractive round napkin ring has a floral repousse decorations all around. Dimensions: 1 7/8" - 1 1/2", weight 34 grams or 1.1 ozs Troy. The excellent original condition and clear, crisp detail, with no monograms, removals, repairs or alterations, make this an especially attractive offering. The soft, warm, original antique finish is present, with no buffing or machine polishing. American sterling silver Victorian Baroque style napkin ring by National Silver Co. c. 1900. This elegant napkin ring features nicely detailed applied scroll decorated rims and is monogrammed in ornate period script JG Dimensions: 1 7/8" - 1 3/4" and weighs 37 grams or 1.2 ozs Troy. The excellent original condition and clear, crisp detail, with no removals, repairs or alterations, make this an especially attractive offering. Monogrammed as described above, the soft, warm, original finish is present, with no buffing or machine polishing. American sterling silver shaped napkin ring c. 1920. 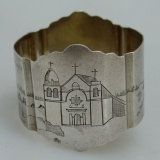 This unusual napkin ring features an engraved scene of the Mission Dolores in San Francisco on a mat finish background. Marked Sterling this special napkin ring is likely the work of a Russian Ã©migrÃ© silversmith, whose mark is W. Dimensions: 2 1/8" - 1 1/2" - 1 1/4", weight 38 grams or 1.2 ozs Troy. The excellent original condition and clear, crisp detail, with no removals, repairs or alterations, make this an especially attractive offering. The soft, warm, original antique finish is present, with no buffing or machine polishing. American sterling silver napkin ring by Towle c. 1900. This beautiful napkin ring has dramatic applied scroll borders, monogrammed EMH. Dimensions: 1 7/8" - 1 1/2" weight 38 grams or 1.2 ozs Troy. The excellent original condition and clear, crisp detail, with no removals, repairs or alterations, make this an especially attractive offering. Monogrammed as described above, the soft, warm, original antique finish is present, with no buffing or machine polishing. 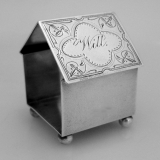 American sterling silver figural napkin ring shaped as a house by Wood & Hughes NY City c. 1880. This unusual napkin ring sits on four ball feet and is monogrammed Will on one of the roof panels. Dimensions: 2 1/8" - 1 7/8", weight 56 grams or 1.8 ozs Troy. The excellent original condition and clear, crisp detail, with no removals, repairs or alterations, make this an especially attractive offering. Monogrammed as described above, the soft, warm, original antique finish is present, with no buffing or machine polishing. American coin silver Aesthetic napkin ring by Wood & Hughes c. 1875. This elegant napkin ring features a central band of die rolled fleur-de-lis, palm frond and rosette decorations heaving beaded borders, surrounding a rectangular cartouche containing an ornate period monogram BJ. Dimensions: 1 3/4" - 1 3/4", weight 45 grams or 1.4 ozs Troy. The excellent original condition and clear, crisp detail, with no removals, repairs or alterations, make this an especially attractive offering. Monogrammed as described above, the soft, warm, original antique finish is present, with no buffing or machine polishing. 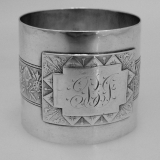 American coin silver napkin ring with a tapered floral repousse body having applied scroll borders, monogrammed in an ornate period script AMW. Unmarked, but guaranteed to be as represented. Dimensions: 2 1/8" - 1 1/2", weight 36 grams or 1.2 ozs Troy. The excellent original condition and clear, crisp detail, with no removals, repairs or alterations, make this an especially attractive offering. Monogrammed as described above, the soft, warm, original antique finish is present, with no buffing or machine polishing. American coin silver napkin ring by Wood & Hughes c.1875. This attractive napkin ring has a heavily embossed allover basket weave design with an applied engraved diamond and square plaque resulting an eight pointed star containing an ornate monogram GAR. Dimensions: 1 3/4" - 1", weight 28 grams or 0.9 ozs Troy. The excellent original condition and clear, crisp detail, with no removals, repairs or alterations, make this an especially attractive offering. Monogrammed as described above, the soft, warm, original antique finish is present, with no buffing or machine polishing. American sterling silver shaped napkin ring c. 1920. 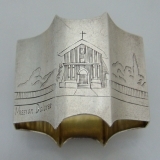 This unusual napkin ring features an engraved scene of the San Carlos Boromeo Mission in San Francisco on a mat finish background. Marked Sterling this special napkin ring is likely the work of a Russian Ã©migrÃ© silversmith, whose mark is W. Dimensions: 1 7/8" - 1 1/2" - 1 1/2", weight 30 grams or 1 ozs Troy. The excellent original condition and clear, crisp detail, with no removals, repairs or alterations, make this an especially attractive offering. The soft, warm, original antique finish is present, with no buffing or machine polishing. 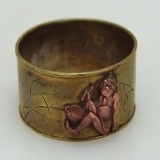 Japanese mixed metals (copper and silver on brass) napkin ring c. 1920. This unusual napkin ring has nicely detailed applied copper creature and silver herons on a brass body. Dimensions: 1 7/8" - 7/8". The excellent original condition and clear, crisp detail, with no monograms, removals, repairs or alterations, make this an especially attractive offering. The soft, warm, original antique finish is present, with no buffing or machine polishing. South African sterling silver elongated octagonal napkin ring with applied South African Crown silver coin. The inscription on the back of the ring reads: Deborah Gill Rob Roy Hotel Botha′s Hill Natal, S. Africa January 1952. Dimensions: 2" - 1 3/8" - 1 1/2", weight 92 grams or 3 ozs Troy. The excellent original condition and clear, crisp detail, with no removals, repairs or alterations, make this an especially attractive offering. Monogrammed as described above, the soft, warm, original antique finish is present, with no buffing or machine polishing. American sterling silver Baroque style napkin ring by Gorham c.1900. This ornate napkin ring has wide borders of scroll work, and an ornate period script monogram EMH. Dimensions: 1 7/8" - 1 3/4", weight 38 grams or 1.2 ozs Troy. The excellent original condition and clear, crisp detail, with no removals, repairs or alterations, make this an especially attractive offering. Monogrammed as described above, the soft, warm, original antique finish is present, with no buffing or machine polishing. 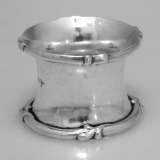 American sterling silver Aesthetic acid etched napkin ring c. 1900. 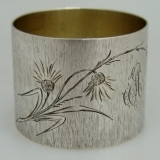 This unusual napkin ring has floral and foliate acid etched decorations. Dimensions: 1 3/4" - 1 3/8", and weighs 34 grams or 1 ozs Troy. The excellent original condition and clear, crisp detail, with no monograms, removals, repairs or alterations, make this an especially attractive offering. The soft, warm, original antique finish is present, with no buffing or machine polishing. 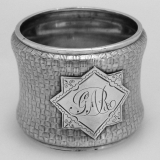 American sterling silver napkin ring by Shreve & Co San Francisco c. 1900. This heavy handsome napkin ring has applied high relief shell and quatrefoil bands set on a stippled backgroung, plain body is inscribed Uncle Delos in period ornate script. Dimensions: 1 15/16" - 1 1/2", weight 58 grams or 1.9 ozs Troy. The excellent original condition and clear, crisp detail, with no removals, repairs or alterations, make this an especially attractive offering. Monogrammed as described above, the soft, warm, original antique finish is present, with no buffing or machine polishing. American sterling silver ornate napkin ring by Wallace Silversmiths c. 1950. This elegant and nicely detailed napkin ring has a high relief floral and scroll repousse center band and flared rims engraved with the name Lou. Dimensions: 1 7/8" - 1", and weighs 27 grams or 0.9 ozs Troy. The excellent original condition and clear, crisp detail, with no removals, repairs or alterations, make this an especially attractive offering. Monogrammed as described above, the soft, warm, original finish is present, with no buffing or machine polishing. American sterling silver napkin ring by Gorham Silversmiths c. 1900. This very elegant napkin ring has applied Buttercup and scroll borders. This beautiful napkin ring would go nicely with your Buttercup flatware or for that matter, any floral flatware pattern, monogrammed HW. Dimensions: 1 7/8" - 1 1/2" and weighs 27 grams or 0.9 ozs Troy. The excellent original condition and clear, crisp detail, with no removals, repairs or alterations, make this an especially attractive offering. Monogrammed as described above, the soft, warm, original antique finish is present, with no buffing or machine polishing. American coin silver napkin ring c. 1870. This beautiful napkin ring has rims with lower applied beaded borders. It has a reserve monogrammed SEP, surrounded by grape vine engravings. Dimensions: 1 7/8" - 1 3/8", weight 39 grams or 1.3 ozs Troy. The original condition with no removals, repairs or alterations, make this an especially attractive offering. Monogrammed as described above, the soft, warm, original finish is present. American sterling silver Baroque style napkin ring by Knowles c.1900. This ornate napkin ring has wide borders of applied open scroll work. Dimensions: 1 3/4" - 1 3/8", weight 43 grams or 1.4 ozs Troy. The excellent original condition and clear, crisp detail, with no removals, repairs or alterations, make this an especially attractive offering. Monogrammed as described above, the soft, warm, original antique finish is present, with no buffing or machine polishing. American sterling silver napkin ring by International c. 1900. This stunning napkin ring has applied floral lily borders. Dimensions: 2" - 1 5/8", weight 35 grams or 1.1 ozs Troy. The excellent original condition and clear, crisp detail, with no removals, repairs or alterations, make this an especially attractive offering. Monogrammed as described above, the soft, warm, original antique finish is present, with no buffing or machine polishing. American coin silver round napkin ring c. 1875. This elegant napkin ring has nicely detailed basket weave rims and the body has engraved geometric designs. The central reserve has a period script monogram I.D.T. Dimensions: 2" - 1 5/8", weighs 28 grams or 0.9 ozs Troy. The excellent original condition and clear, crisp detail, with no removals, repairs or alterations, make this an especially attractive offering. Monogrammed as described above, the soft, warm, original finish is present, with no buffing or machine polishing. American coin silver napkin ring c. 1880. This napkin ring has wide reeded borders with a reserve engraved EPB, surrounded by rosette and scroll engravings. Dimensions: 1 3/4" - 1 1/2", weight 42 grams or 1.4 ozs Troy. The excellent original condition and clear, crisp detail, with no removals, repairs or alterations, make this an especially attractive offering. Monogrammed as described above, the soft, warm, original finish is present, with no buffing or machine polishing. American sterling silver Aesthetic floral napkin ring by Gorham Silversmiths c. 1890. This large and nicely detailed napkin ring has wide diagonal floral chased bands and an ornate period script MET monogram and is dated Aug(ust) 6(th), (19)14. Dimensions: 1 7/8" - 2" and weighs 51 grams or 1.6 ozs Troy. The excellent original condition and clear, crisp detail, with no removals, repairs or alterations, make this an especially attractive offering. Monogrammed as described above, the soft, warm, original finish is present, with no buffing or machine polishing.